My Spanish barista friends must have thought I was mad when shortly after sitting down to an afternoon Earl Grey, I frantically asked in broken Spanish if they could watch my heavy bag while I ran back to the metro station for Gertrude Stein. I was taking "American Writers in Paris" while studying English literature in Madrid (yeah, process that for a moment), and I'd been reading a copy of "The Autobiography of Alice B. Toklas" I stole from a library in Texas. I'd left it on the subway and panicked when I realized this. Fortunately, the woman at the ticket counter understood my description of a small red book and produced it with a smile that said "you might be crazy, please leave now." Today, this little hardback sits on my shelf, and every time I look at it, I remember this experience and smile. No other book has the same backstory. Had I been carrying an e-reader, I probably wouldn't have gotten it back and I wouldn't attach this memory to any particular text. Cut to last fall, when I purchased my first e-reader. It was a momentous occasion. Just a mere three years ago, I was fiercely devoted to print (hell, I worked at a newspaper). And to this day, when I walk into a good bookstore, I find myself needing to pee from excitement. But I've grown to love this digital format... and grown annoyed with the idea that I'm cheating on my other books. 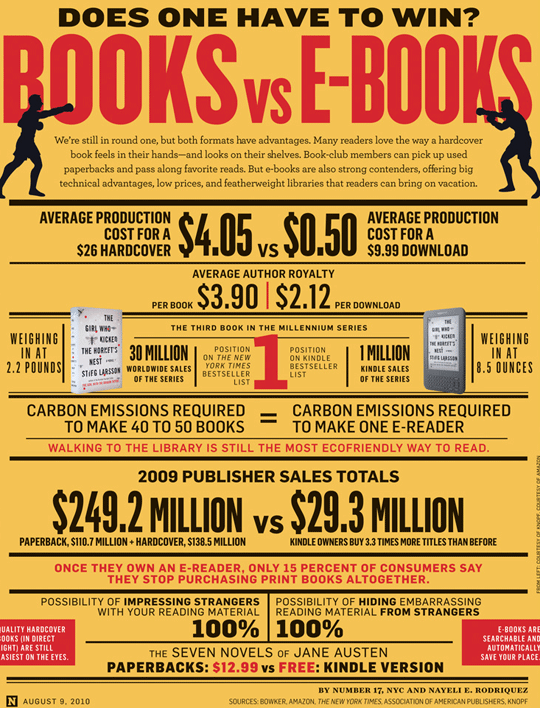 The notion that e-books are inferior to "real" books is a misconstrued debate, and the fighting has to stop. It's about as productive as arguing over whether listening to an audio book "counts" as reading a book. Seriously? The "real thing" when it comes to storytelling goes further back than Gutenberg's press—all the way to oral storytelling traditions. So maybe audiobooks are really more authentic choices. Stories are an experience. The format of that experience is not what makes the content worth engaging. Feedback. When I downloaded my first e-books, I also started using ReadMill. It is an almost surreal experience to be able to tweet comments on specific selections not only to my friends but to the actual author as well. She may not reply back, but I can give immediate feedback on how I'm receiving her work (although I've engaged in conversations with two authors via Twitter so far). Community. As much as I love book clubs (and don't intend to give them up), it's also fantastic to immediately see how people I will never meet IRL respond to something I've reacted to. My thoughts can be immediately influenced by others if I choose and thus have the chance to mature faster. I hope to see more web content structured this way in the future. In fact, I'd argue that reader feedback methods on most blog is disappointingly behind the curve (but that's another blog post). Accessibility. Despite the abundance of trolling and otherwise disappointing human behavior, the potential this medium holds is mind blowing. As a civilization, it's startling how quickly we've moved from the preciousness of printed materials to an information free-for-all. What this means for education in places with limited opportunities is even more inspiring to me. The long of the short of this bookish debate is that e-books can do things and have advantages that printed books cannot and do not. But the reverse is true as well. Each format has its place, and I want to see what each can accomplish that the other cannot. For example, if you're going to spend the money to print something, make it different than what could be conveyed in a digital format. I'm currently reading Kern and Burn: Conversations With Design Entrepreneurs, which has been bound in a lovely soft-touch coating that actually makes me pick up the book more often. That, my friends, is the power of print—and it's not being exercised often enough. But here's the real secret: you don't have to choose one or the other. You can love both (and most people are not exclusive with their book choices). I have by no stretch of the imagination abandoned print (more than a dozen boxes of books my Dad has moved more than once is a testament to that). I stand in old bookstores and just breathe in the stories (ones printed on pages and ones left there by their former owners)—but I also spend my day writing content for the web. I have 6 pen pals I handwrite letters to every month—but I send email every hour. Print and digital content are not at war. They are allies in the greater battle against ignorance.